Bring more fun into your life with 20 patterns for rainbow-hued and multicolored knits. Rainbows are everywhere—in rainbow hair, rainbow toast, and rainbow knits. 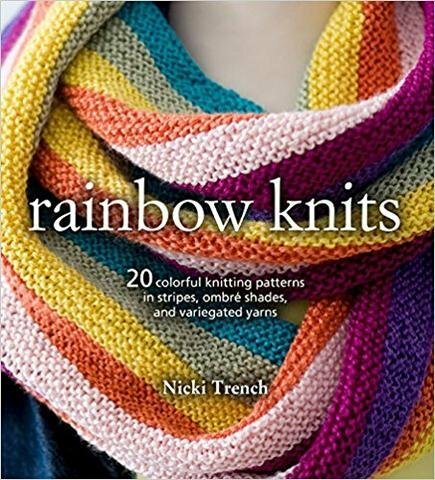 Whether you like the bright colors of a true rainbow or softer shades of the spectrum, there is something for you in this collection of 20 patterns by Nicki Trench. There is a cute rainbow-yoked baby cardigan, a silky striped tie, stripy sweaters and cardigans, and a purse embroidered with multicolored flowers to make as a gift. Then there are accessories for adults, including a bobble hat and a cabled scarf, as well as makes for the nursery including baby blankets, a hat, and a sweater. There's even a striped baby blanket in all the colors of the rainbow, easy enough for a beginner to knit, and a lovely gift for a new arrival. If you don’t want to go all-out on the rainbow theme, then the cabled pillow with rainbow-colored tassels could be for you. Just get out your needles and knit your own rainbows.